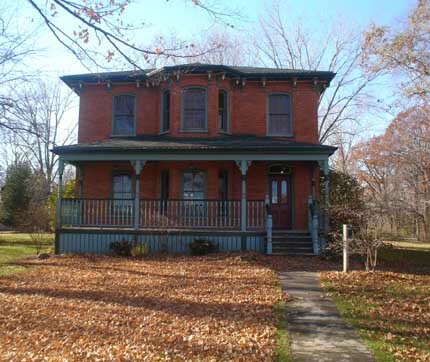 The Maple Rest Heritage House is a four bedroom Victorian era home that is furnished with antiques. It is available for rentals, and located in Sandbanks, which is a prime Ontario vacation spot. We received the following report in regards to this home in October 2010, but the events described occurred earlier in the same year. "Our group rents the house every year for an extended weekend. After dinner we sit around and discuss the day's events. Two different people, 2 years in a row have seen a figure walk (float?) through the back porch or by the porch in the back yard. It appears to be a small man or tall child/teen. He wears a hat and a jacket and passes from north to south. He seems to be slightly hunched, perhaps against the cold? He does not appear threatening. The first sighting we thought someone was outside so we went out to investigate, however no one was seen and there were no footprints in the snow. The second year I saw him and tried to get everyone's attention, but he moved too fast and was gone. Once again, there was no evidence of anyone being outside around the building. We have looked through the photos of previous owners etc. hanging throughout the house but have had no luck. We have also mentioned it to the Park staff, but it seems that ours is the only report. We would love to know if you could figure out who he is. A previous owner, staff or guest from days gone-by? Our speculation is that it's probably a previous owner or family member from when the house was a guest house/summer home. At one time it was known for it's gatherings, so we think perhaps it's someone checking in on our group making sure that the party's going well and we are all enjoying ourselves, just like a good host would do. We will be at the house next year, and hope to see him again."